Will Thacker (Hugh Grant) owns a bookstore dedicated to travel-related books in the London district of Notting Hill. He lives a modest life, struggling to keep the book shop afloat and sharing his house with an eccentric man named Spike (Rhys Ifans). Anna Scott (Julia Roberts) is a major Hollywood star who has found fame, but at the cost of happiness. She first meets Will at his bookstore. They meet again soon after, when he bumps into her in the street and spills orange juice all over her. With his house nearby, Will invites Anna over to change and clean up the orange juice spill. When they separate, Will is sure he’ll never hear from Anna again. But Anna calls… and a relationship blossoms. I first saw this film at least ten years ago and didn’t care for it. I hadn’t re-watched it since. I’ve always been a big fan of romantic comedies and am puzzled by the fact that I didn’t immediately love this one. Richard Curtis! A main character that owns a book shop! Hugh Bonneville in a supporting role! A reference to Rita Hayworth! 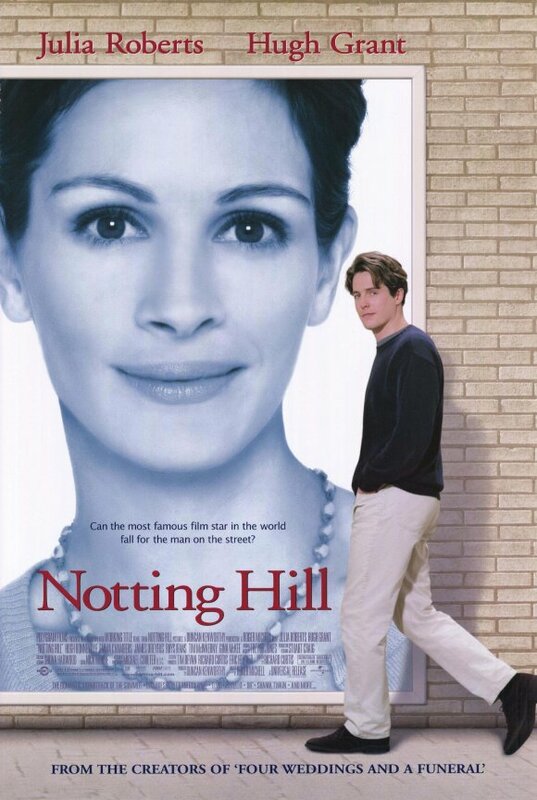 What exactly did I find to hate about Notting Hill upon first watch? We may never know the answer to that question, because as it turns out, I enjoyed the film a lot more second time around. Though the script meanders at times, it’s very witty. The chemistry between Julia Roberts and Hugh Grant was one of the most interesting aspects of the film to me. They’re somewhat awkward together, but also charming. Anna is very closed off when they first meet, and understandably so, given her profession and fame. Their characters get to know each other very naturally, first meeting at his book shop and then growing closer little by little. The film has a realistic pace that is neither rushed nor slow. The progression of the story is realistic as well. While it’s clear to the viewer that they’re Made For Each Other, Will and Anna don’t fall into a whirlwind love-at-first-sight romance. When Will learns that Anna is attached to a Hollywood beau, he leaves her alone and dates around, as any hurt-but-sane person would. I appreciate the fact that the film often feels true-to-life and not quite as exaggerated as rom-coms can sometimes be. Much has been said about the film’s music. Richard Curtis’ films always have very deliberately-selected soundtracks, and I usually like them. (About Time and Love Actually are among my favorites!) The music of Notting Hill ranges from great (Al Green’s “How Can You Mend a Broken Heart”) to grating (Elvis Costello’s cover of “She”). Perhaps it was the more distracting side of the soundtrack that put me off of the film initially. 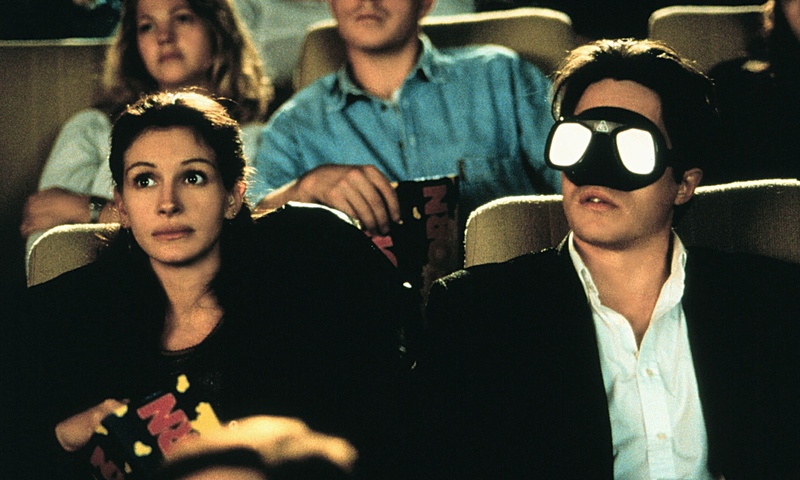 Notting Hill won’t be topping my list of all-time favorite rom-coms, but I do appreciate it after giving it a second look and certainly wouldn’t mind watching it again. I’ve seen it once, more than ten years ago, and I wasn’t all that impressed, either. Maybe I’m due for Viewing #2 as well.